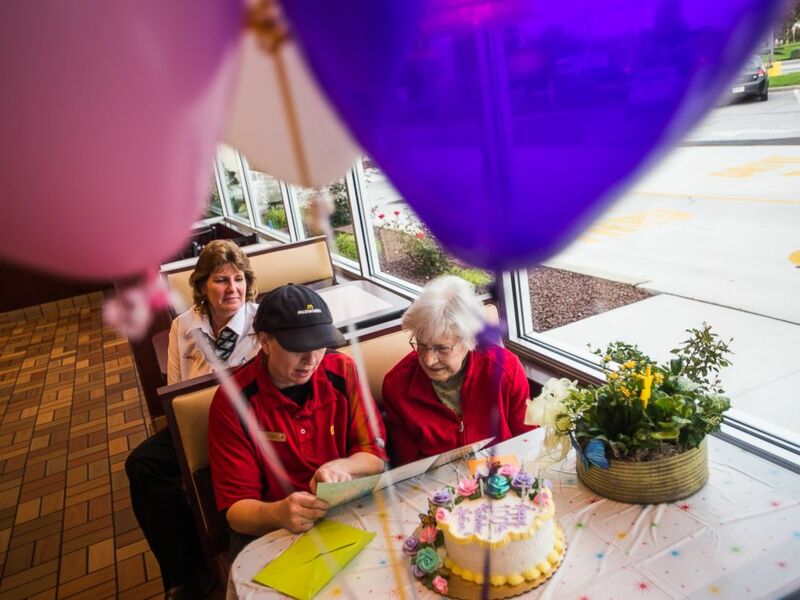 One Mickey D's patron got the surprise of a lifetime last week, after the restaurant threw her a 100th birthday party. Nadine Baum turned 100 years old on Oct. 13 and celebrated by eating lunch at her local McDonald's in Hanover, Pennsylvania with her son, Mike Baum. But the centenarian did not know that the staff had organized a party for her. "We had cake, flowers, balloons and we just sang 'Happy Birthday' to her and let her eat lunch," McDonald's employee Sandy Arentz, 52, told ABC News today. "She's very pleasant. She's talkative and friendly to everybody. We celebrated this milestone to show her how special she is." Nadine Baum reads a birthday card with McDonald's employee Kim Birgensmith and manager Sandy Arentz, background, Oct. 13, 2016 at the south Hanover McDonald's. Arentz, a 35-year employee of McDonald's, said Baum had been coming in for sit-down meals for years and developed relationships with the staff. Arentz's colleague Ginny Slaubaugh, 62, whose been with that Pennsylvania McDonald's franchise for almost 40 years, told ABC News that she met Baum while working the front counter. "Last year, she was 99 and me and another girl took money out of her own pockets for a cupcake, [and] we had a card passed around," Slaubaugh said. "Nadine, she's special, of course. She's beautiful. You would not believe that she was 100." 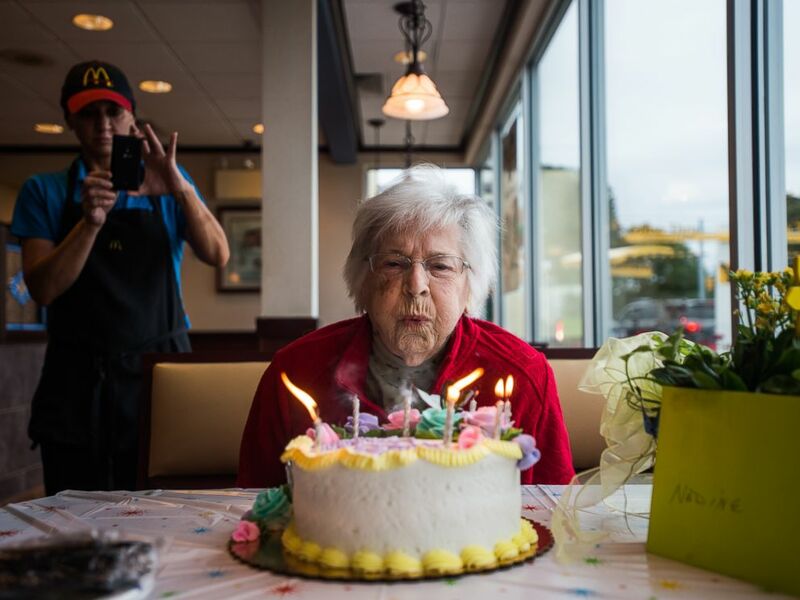 Nadine Baum blows out the candles on her birthday cake, Oct. 13, 2016, at the south Hanover McDonald's during a 100th birthday celebration for the Hanover centenarian. Slaubaugh said her manager Sean Patterson offered to take care of all expenses for Baum's 100th birthday celebration this year, and gifted her with free meals for life. "If you could talk about a surprise," Baum told ABC News, laughing. "I just felt wonderful. It's just such good feeling to know that you have such good friends. "I said that I'm going to go in 3 times a day, every day," she said.